Wake Forest University, my alma mater, is only a little over an hour away, and indeed our tee-time was set the next morning in Mt. 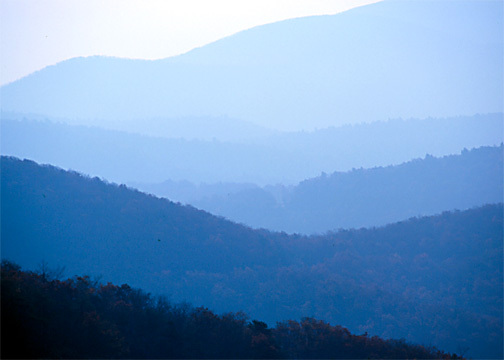 Airy, North Carolina, which abuts Pilot Mountain, a favorite haunt of Wake students. My old stomping grounds, as they say. I knew ahead of time that I would arrive before Colin (who also brought along a buddy from medical school). They had classes or seminars or at any rate some obligation until mid-afternoon, followed by the infamous DC traffic snarl to escape, while I was free to leave in the late morning, thus passing through the last big urban stretch of my route — Charlotte — well before rush hour. I departed the interstate for back roads around 5 pm, providentially having called Colin on the cellphone at the last rest stop (though I neglected to call my wife: more on that in a moment) to urge him to buy ice, before cellphone service failed. I found this latter development strangely reassuring. That blasted little machine would not bother us all weekend. Once in the mountains, the savage August heat and humidity diminished a bit to a comfortable warmth. I rolled down the windows and rolled along those blue hills to the chords of “Sugar Magnolia” (a song that will ever remind me of my wife, whom I met on the magnolia bedecked campus of Wake Forest) and “Visions of Johanna,” and even The Who’s celebrated cover of “Summertime Blues.” A marvelous, leisurely drive. Once at the campground, found with relative ease with the assistance of a Google map studied beforehand, the order of business was to find a suitable campsite. My tent-camping in Virginia book had recommended sites 18-20, but site 11 caught my eye for the liberality with which a previous camper had vacated it: a nice stack of firewood, left there for the taking. So I parked the car, shut off the jarring music — my affection for which our own Steve Burton rightly calls a weakness — and set out to study the grounds. And I still have the scrapes and scratches to show for it. I had looked carefully for poison ivy and, seeing none, plunged into the forest to shortcut the little switchback road that led down to the creek. Bad idea. Thorns and brambles greeted the attempt, and decisively deterred any further attempts. I returned briefly to the campsite to lick my wounds over a cold beer. Rarely has the cheap stuff tasted so good. It soon dawned on me that I owed my wife a call announcing my safe arrival. Without cellphone service, this would require a considerable drive north toward Wytheville, Virginia. But this did not bother me, for the pleasure of driving those backwoods roads would only multiply as the late afternoon sunlight failed. Some of these roads are not for the feint of heart: one-lane bridges, obscured by draping foliage, long stretches of single-lane road, poorly-marked intersections, and the like. But for five miles or so the road traces the winding path of Cripple Creek, and beside you spans a lush little valley, a bit hazy in the muggy air, but blue as any ridge imaginable. I arrived at a gas station and proceeded to throw away $1.50 on a useless payphone. I worried that perhaps I would have to drive all the way to Wytheville; but, having no other option (the restaurant across the street would not let me call long distance) I took to the road again. Not a half-mile later, I spotted another payphone, checked the mirrors, made a sharp but exhilarating U-turn, called home, talked to my lovely wife, and took the windy road back to the campground. By now it was probably 7pm. I had chicken breasts and bratwursts, and a little tabletop grill; but I wanted to wait for Colin, so I sat down with another beer and a copy of Chesterton’s epic poem The Ballad of the White Horse, to read it aloud — as it ought to be read. Some time later, as twilight approached, it came time for a longer walk. Stuffing two more beers in my pockets, I wandered off toward the hiking trail on the far side of the little picnic area. On the way I encountered several deer, including a doe and fawn, and later a young buck that frightened me as he bolted. Back to camp. More beer. More Chesterton, now by the light of campfire and flashlight. It is a magnificent poem, full of Chesterton’s characteristic verbal felicities and lightly-worn erudition; his little Englander patriotism; his rich sense of history and myth; his easy jocularity contrasted with his very serious insight; his great “metaphysical intuition of being,” in the singular phrase of Hugh Kenner; and above all his splendid faith in God. 9:30pm and still no sign of my friends. I was eager to read the poem aloud for them, but now a more dreary thought occurred to me; for there were many possible reasons why their trip might have had to be aborted, ranging for the mundane to the catastrophic. Worse still, they had the tent — a fact which presented me with the deflating possibility of having to sleep in the car or on the dirt. More than that, I was damned hungry. I resolved to begin cooking at 10, with or without them. So 10 o’clock came and went, and I mournfully started the charcoal in little grill. As it happens, the telltale crunch of tires on a gravel road reached my ears just as the meat was nearly cooked. I could see headlights down on the switchback below, and must confess that I jumped for joy at the sight. I was offered profuse apologies and explanations of wrong turns on dark country roads; but these were quite unnecessary. My relief was complete. I never did get to read from Chesterton, for a variety of reasons. (1) They brought more beer, and an eagerness to drink it — understandable enough after an hour or two of dark, winding, poorly-marked roads — and I began to wonder whether I had the capacity to really do the verse justice. (2) Bratwursts and beer next to the campfire has a somewhat lethargic, not to say narcotic, effect. (3) I was waylaid by inquiries about my forthcoming book on the Jihad, which sent me off on my now-familiar polemic against tolerance for Islamic sedition, and my equally-familiar responses to various objections. It is difficult to say how effective my presentation was, for by now it was very late and we were many beers deep. In the past, as I mentioned here, my heart has thrilled with hope to discover that even Liberal acquaintances with which I would disagree on most everything, are open to my calls for a firm proscription of the doctrine of Jihad. Morning came early, as it always does after a night like that. But grogginess (and some embarrassment on my part) was quickly outweighed by the prospect of a morning drive down off the Blue Ridge to play golf in rural North Carolina. Arriving at the golf course, the first thing the struck us was the heat, which was going to be considerable, but which had the beneficial effect of deterring the locals from the course. We only saw a couple other groups of golfers the entire time, one of which, in true Carolina-redneck fashion, included a man golfing shirtless in blue jeans. The course was in decent shape — horribly dry and hard fairways balanced by generally well-maintained greens — and featured a lot of appealing short par 4s, requiring more strategy and imagination than distance off the tee. I played well despite several disastrous holes, and ended up carding a number far below what I expected. By mid-afternoon, near the end of the round, the place felt like a sauna. The lady in the clubhouse told me the temperature had reached 105 the day before. After a lunch of sub sandwiches, which never tasted so good, we went our separate ways, sorrowfully, and vowing to do it again sometime. I hope we do. Next time I’ll make sure to read them some of Chesterton’s marvelous Ballad. Wonderful post, Paul. It's a good thing you post such long quotations from the Ballad of the White Horse, because I never do get around to getting a copy. But every time you do it, I swear I will. Ignatius Press has a wonderful edition that features a very rich annotation in the back. Some people get to take vacations, and some of us don't. Is that the Cripple Creek that The Band sang about, or is that before your time? I have wanted to go to Mt. Rogers for a while now. Some day soon, I hope. It sounds like time well-spent. Ha! I actually looked that up before writing, Bill. According to Wikipedia, the Cripple Creek in that song is the one in Colorado. Go figure. Cyrus: I highly recommend the place. Our campground was called Raven Cliff. It's on the north side of the park. Beautiful, serene, and free from RVs. I imagine in the cool autumn months it would be breathtaking. I highly recommend the place. Our campground was called Raven Cliff. It's on the north side of the park. Beautiful, serene, and free from RVs. I imagine in the cool autumn months it would be breathtaking. I bet. My wife has this strange attachment to indoor plumbing, though. I may have to wait until I have sons, God willing. Great post. It reminds me of the feeling I might get at summer concert at Red Rocks amphitheater, watching the sun stretch its rays over thousands of spectator's backs and down to the streets of Denver with "jarring" music to accompany. Or of long walks at dusk on Upper Bear Creek. Nature and friends are quite the blessing.